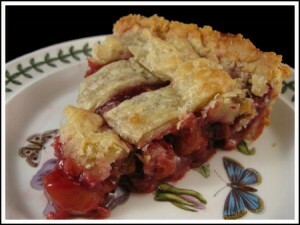 Thanksgiving Cherry Berry Pie An easy cherry pie made with frozen cherries and berries. 1 unbaked pie crust (see directions below) plus second unbaked crust for latticing. Combine half cup of cherry liquid and half cup of the raspberry juice to make one cup combined. Set the juice and fruit aside. Combine sugars and cornstarch in a small saucepan. Whisk in the 1 cup of fruit juice and cook over medium heat until thickened and bubbly. Cook and stir 2 minutes more. Remove from heat. Stir in almond extract, vanilla and soft butter. Stir in drained cherries and raspberries. Fill pie shell with cherry-berry mixture. Roll out second portion of dough into a 12 inch circle and cut into 1 inch strips. Arrange in a lattice pattern over cherry filling, weaving strips crosswise over and under lengthwise strips. Trim pastry strips even with edge of bottom crust. Fold bottom pastry over lattice strips and seal. Flute edge. Shield edges of pie with foil to prevent excess browning if you feel you need too. I didn’t. Set pie on a baking sheet and bake for 45 to 50 minutes until crust is golden brown. Remove foil strip during final 15 minutes of baking time.